Like jade jewels scattered across the vast blue of the Pacific Ocean, Fiji’s 333 glorious islands reveal an alluring fusion of idyllic beaches, pristine rainforest, exhilarating adventure and crystal-clear lagoons. Known as the ‘soft coral capital of the world’, Fiji is as breathtaking below the surface as above, with a vibrant and varied marine world shimmering beneath the sun-dappled waves. 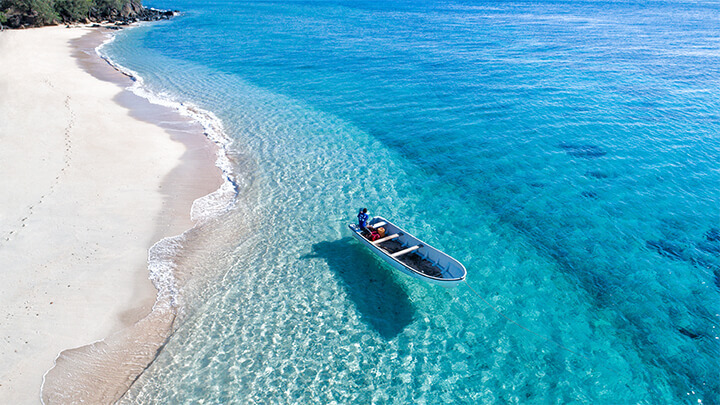 Delving into Fiji’s warm, tropical underwater world is an unmissable part of a holiday to Fiji, with young and old, experienced and novice, able to explore the turquoise waters straight from the beach or on a guided reef trip. Divers from around the world are enthralled by Fiji’s world-renowned dive sites, including the famous Rainbow Reef near Taveuni and the Great Astrolabe Reef in the Kadavu archipelago. Fiji also offers cageless shark diving for the seriously adventurous traveller! 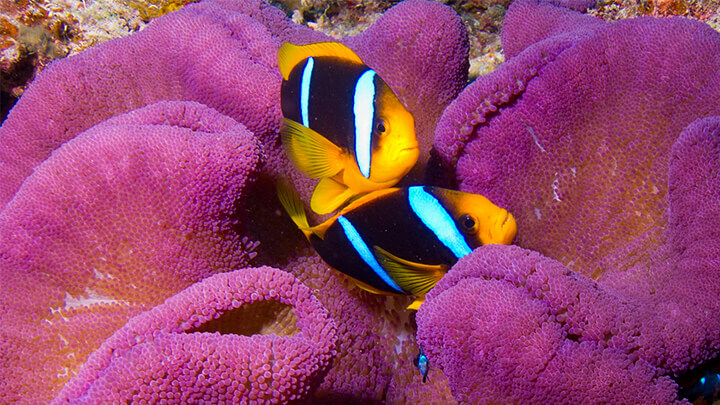 Teeming with colourful corals, giant clams, reef sharks, manta rays, turtles and over 1500 species of fish, Fiji is truly a snorkelling and diving paradise! Diving in Fiji is wonderful all year round, with visibility at its best from July to December (up to 45 metres) when the water is cooler (around 23°C). This coincides with the peak season for travel to Fiji (May to October) when the weather is a warm with less rainfall. During Fiji’s summer months, from January to March, water temperatures rise to around 29°C, and plankton increases along with stronger seasonal winds, hence a slight reduction in visibility. The weather also becomes hotter and more humid during the summer with higher chances of tropical downpours and cyclones, but the diving remains exceptional! The Great Astrolabe Reef, one of the largest barrier reefs on the planet, is located south of the main island of Viti Levu in the Kadavu region and considered one of the best dive locations in the world. Turtles, dolphins, manta rays and reef sharks call the Great Astrolabe home, and humpback whales make seasonal appearances. Divers from around the world are enthralled by the world-renowned dive sites situated between Taveuni and Vanua Levu in the Somosomo Strait. Rainbow Reef is consistently ranked in the world’s top dive sites, and the Great White Wall is particularly spectacular, with strong tidal currents bringing rich nutrients, perfect for coral growth and a healthy eco-system. Elegant, majestic and graceful, manta rays are fascinating ocean giants with a wing span that can reach up to 7 metres. Despite their size, they are harmless to humans as they do not have a sting in their tail, and they are filter feeders so their diet is primarily plankton and the occasional fish and small crustacean. The abundance of plankton in the channel between Drawaqa Island and Nanuya Balavu makes this prime manta ray territory from May to October each year, and your chance to swim with them is just a 10-minute boat ride from Paradise Cove Resort! Renowned as a magnificent diving location, with numerous impressive dive sites, Beqa lagoon is also Fiji’s shark diving hub! With more than eight different species found here, including bull sharks and tiger sharks, this is a once-in-a-lifetime experience! Get up close in their natural habitat during this cageless dive, and watch in awe as they arrive in large numbers to feed from the hands of your experienced dive master. This spectacular event takes place in a protected Shark Marine Reserve at a dive depth of around 25 metres.